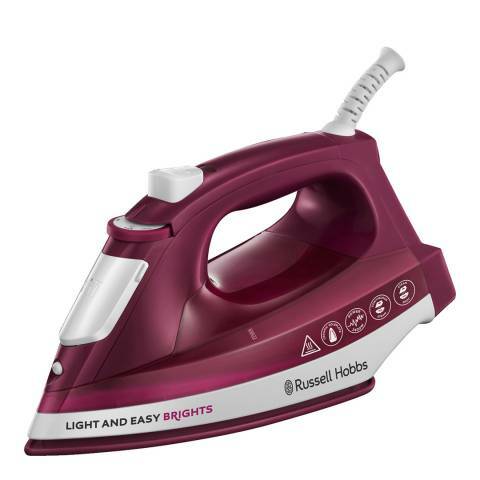 Offering a ceramic soleplate, auto steam technology, 30g continuous steam, 90g steam shot, vertical steam, variable temperature settings and a spray function, this light easy Brights iron can easily tackle even the toughest creases. Its ceramic soleplate provides an easy glide over any type of fabric, while the auto steam feature, 30g per minute continuous steam output and 90g per minute steam shot help smoothen even the most stubborn creases. Its vertical steam feature makes it possible to iron hanging items, such as curtains or shirts, while its variable temperature setting provides the ability to remove wrinkles from a variety of fabrics. The included fill jug makes refilling the iron quick and easy, helping cut down on your ironing time.